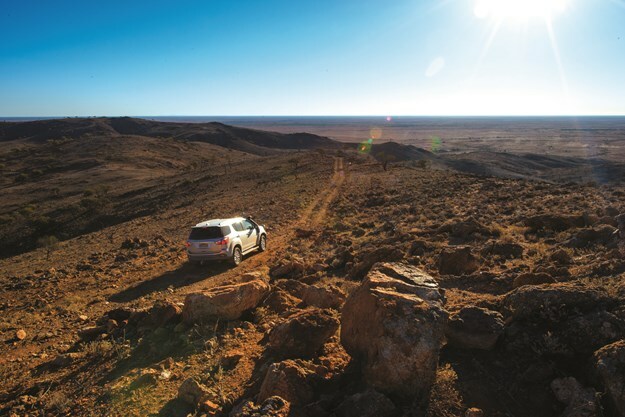 The roads around Eldee Station, NSW, are graded dirt steeped with red dust, so much so I am still trying to get it out of the vents and seals of the Isuzu MU-X – or the Silver Bullet, as it’s now affectionately known. The dust ingress is no fault of the car’s but the result of the need to get the perfect shot out of the window. You see, the MU-X doubled as one of the camera cars for the trip. We sometimes had two camera people hovering in their seats (still belted in, I must add), windows down and screaming to get into the dust stream of the van we were shooting to get the perfect picture. 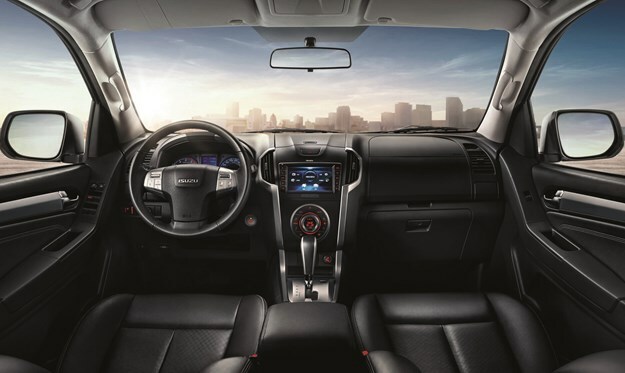 Sweeping the dust aside, internally the Isuzu is a nice place to be with our model, the LS-U, complete with leather accented seats. 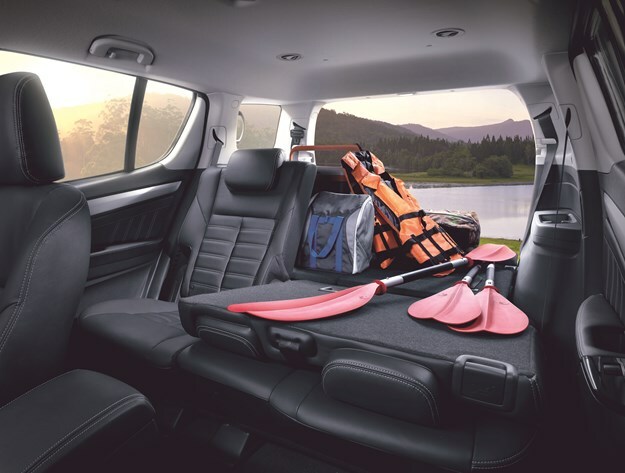 It has a third row of seats, taking its total to seven, though they are best for young or small people, as full-sized adults will only handle a short trip in the back. Folded down there is plenty of room for a full suite of video and photography gear, as we found out. Infotainment is behind the times with the 8” touchscreen not having Apple’s CarPlay or Android Auto, although it didn’t take long to hook up to the Bluetooth for music and calling. Externally, it’s a good looker, with plenty of chrome accents and smart 18” alloy wheels. The standard side steps will be appreciated for anyone less mobile, as will the grab handles just inside the doors. We requested ours with the optional stainless steel bull bar and snorkel as it was to do some dusk and dawn work around the outback and hopefully see some rivers with a camper in tow. We haven’t needed the bull bar yet but it has had some positive comments from other D-MAX and MU-X owners who appreciate the built-in fog lights and robust feel. The MU-X gets its nickname from the power it has. 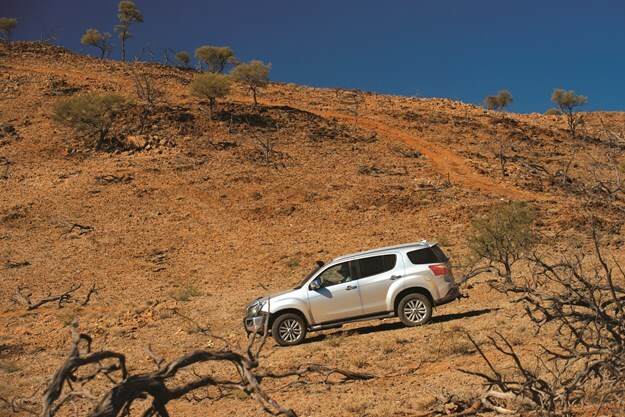 Admittedly, I stepped out of a petrol-powered 100 Series LandCruiser that has been to the moon and back a few times, but the fast-changing auto gearbox and masses of torque (up to 430Nm) make the MU-X fairly nimble for its bulk. It’s no sports car, but you will not struggle to merge onto a freeway or overtake one of our van-towing brethren on the highway. In the rough stuff, I rarely had to put it into 4WD let alone low-range – this was down to the unladen weight and dry conditions. I did, for scientific purposes, try some inclines we were never going to tackle with a van in tow but which would test the MU-X’s factory traction systems that I had heard were fantastic. The MU-X does away with a limited slip differential and has no fully-locking rear diff like some competitors offer. Rather, it relies on brains that pick up on a loss of traction and brakes individual wheels to send power where it is needed, even in low range. This tech has been around for a while and in the past has been more of a hindrance than a benefit, with aggressive braking of the slipping wheel making harsh sounds and jerking without much effective drive. Not the MU-X’s version, it worked great and by the time I left Eldee, I was sold on the concept. It just walked up steep climbs with ease, though we did strike a minor problem. The factory supplied tyres are not up to the outback challenge. They are highway-focused and did not last long in the sharp rocks, but we have since replaced them with some quality all-terrains. We had the Silver Bullet for a few months. We had already put it through its paces in the Victorian High Country with a JB Gator-X in tow as well as a personal trip with a camper in tow, so it shouldn’t surprise that it averages more than 1000km per month with the vast bulk of that towing. The outcome is an average fuel consumption of 8km/L or 12.5L per 100km a touch short of 5000km. To the average user, that will seem high but then the average user wouldn’t be towing as much as we are, so the numbers that really matter are what we see on the road, not the long term averages. Typically, with a 2000kg-2500kg van in tow, we see 5km/L or 20L per 100km – respectable but most impressive is the fleeting moments we are sans a camper behind where we see as good as 14.5km/L or 7L per 100km. These fuel figures are as good as some modern cars and better than the factory claim for this proper, body-on-chassis part-time SUV. Power is great (130kW) though it does have the typical diesel lack of breath when pushed high into its short rev range. Once you learn to allow the gearbox to change early, speed adds on quickly and seamlessly. The engine is derived from the commercial sector, which is a blessing in disguise. The 3L inline four-cylinder serves as the power unit for a large number of small commercial trucks, the likes you see used as delivery trucks. Commercial operators treat their vehicles hard and require reliable and economic service, so the MU-X gets a flow-on from that. The downside is that it’s a bit truck-like in its noise, vibration and harness with a gruff idle and somewhat noisy feel underway. Don’t get me wrong, it is better than a lot of older diesels but some competitors are much better in this regard. Aside from the aforementioned highway factory-supplied tyres, there are a few flaws in the MU-X’s armour. There is a lack of some modern safety tech such as lane departure warning, blind spot monitoring and adaptive cruise control. I will freely admit that these technologies felt to me as unimportant gimmicks until I tried them in a competitor’s product – I would recommend them to buyers should your budget afford it. The other let-down is the small 65L fuel tank in the MU-X which, when towing, requires some planning to maximise distances between stops. 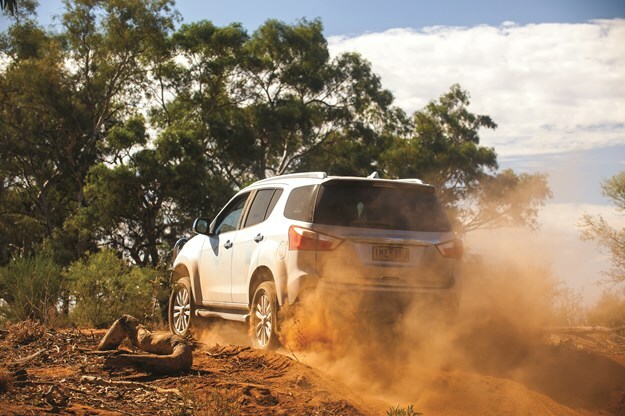 To me, a proper 4X4 comes with selectable low-range 4WD, not just all-wheel drive and some ground clearance. 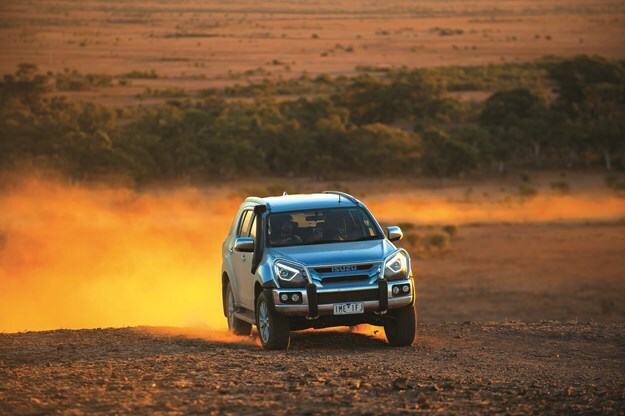 Proper low range allows control offroad by reducing the gear ratio to close to walking speed in first gear. This means you can use more of the rev range without high wheel speeds, giving you more control. It also helps with increasing torque at the wheels – super handy when pulling a heavy van up a hill or a heavy boat up a boat ramp from a standstill. The MU-X and sister D-MAX ute both use a rotary knob to move from 2WD (for everyday driving) to 4-high (for slippery conditions where higher speeds are still needed) and 4-low (for low traction times when extra wheel-torque and lower speeds are necessary). The LS-U has a Tare of 2110kg and a GVM of 2750kg giving it a moderate to low payload of 640kg. When you load the towball to its maximum of 300kg, this becomes an issue for owners who want to take the family and some essentials along for the ride. The GCM is 5750kg, which is not bad considering its 3000kg maximum braking tow rating. It is lower than the D-MAX’s 3500kg for two reasons: firstly the MU-X uses coil springs in the rear, and the wheelbase is shorter. The coils make a dramatic difference to ride quality which is vastly better than the model year 2017 (MY17) D-MAX. We had the privilege to be invited up to Queensland for the launch of the Model Year 2018 (MY18) D-MAX and MU-X. Although not a lot is changing, the small upgrades are important to mention. For us towers, in all but the lowest spec, all D-MAX and MU-X now come standard with Trailer Sway Control and rearview cameras. These are welcome safety additions, and is now standard on most models. 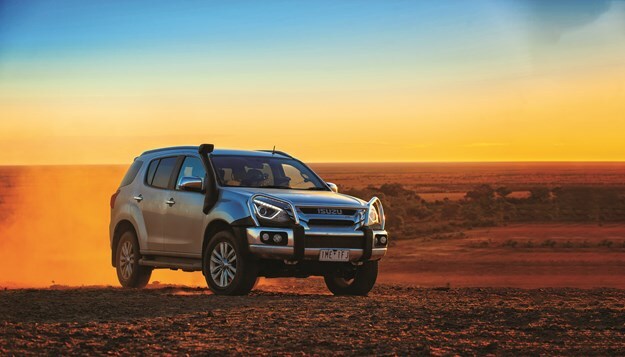 We have tested a few D-MAX utes over the years and did a few thousand kilometres towing a Kokoda around the country a couple of months ago. One bit of feedback we hear and agree with is that the rear suspension was too stiff when unladen. For MY18 utes, Isuzu has moved to a three-leaf spring setup using parabolic leaves. During testing, it was much more compliant over bumps and when loaded up to its max GVM, still handled well without any lurch or bottoming out. Inside, there are minor changes with some new trim and colour combos and the once limited edition LS-T is now offered year-round. Significantly, the team have lengthened service intervals on MY18 D-MAX and MU-X models and capped service prices. 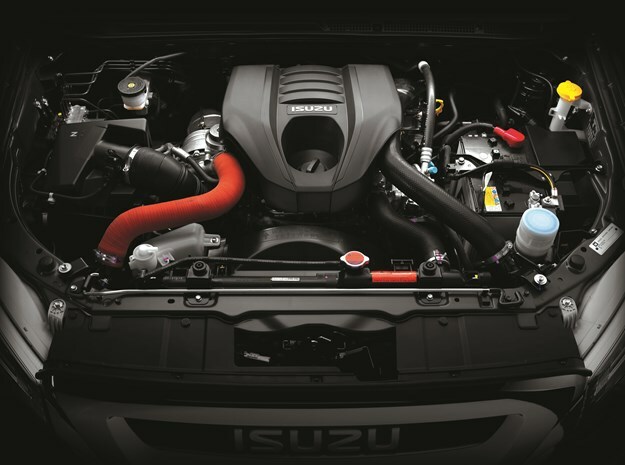 Now only requiring servicing every 15,000km, over five years the capped price is $2090 inc GST – super low when you factor it into the total purchase price and compare it to other brands. The five years or 70,000km capped servicing mirrors the total warranty offered which also comes with the peace of mind of roadside assist. 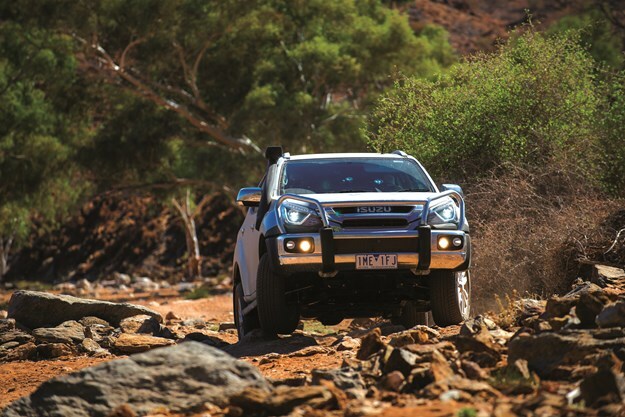 For load luggers, the GVM on the D-MAX ute has been raised to 3050kg for the 4X4 and 2950kg on the 4X2. 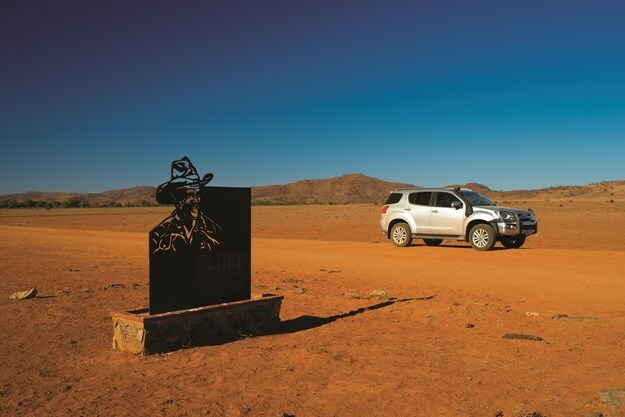 The outcome, on our choice of the range, the midrange LS-U 4X4 is a payload of 1069kg for the auto-equipped ute. Doing the sums and with the maximum 350kg ball weight, it still leaves you a decent amount to work with, though be careful when loading it up with its maximum braked tow capacity of 3500kg as the GCM for the LS-U with auto is only 5950kg. RRP for the MY18 LS-U with auto but before extras like the must-have tow pack, is $50,900 inc GST.